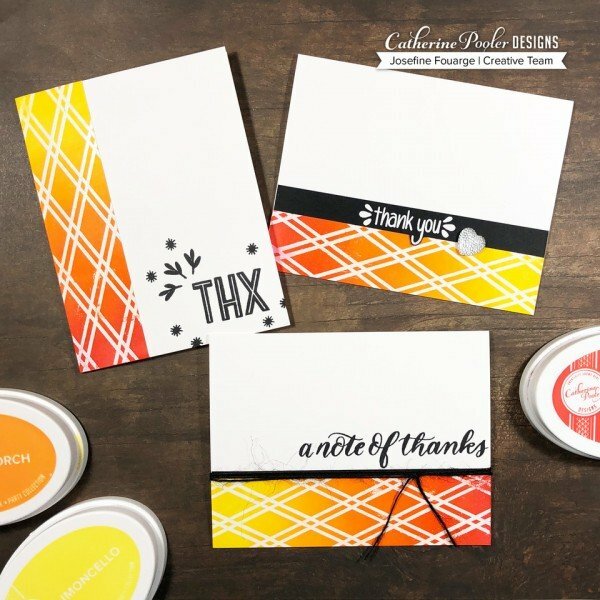 Hi everyone, today I’d like to share a set of “Thank You” cards with you using stamps from the Wild & Wonderful release. They are super easy to create in bulk, so you always have some on hand. I started by stamping the BFF background stamp with Versamark onto a 4 ¼ x 5 ½ piece of cardstock and then heat embossed it with clear embossing powder. 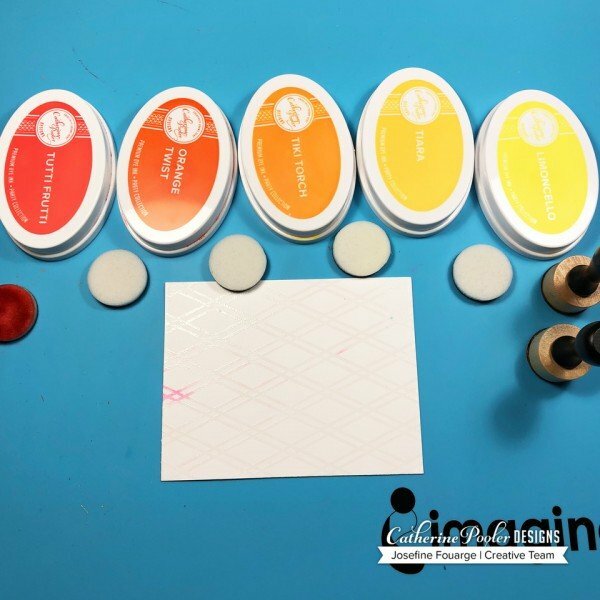 Next I picked the Limoncello ink as well as Tiara, Tiki Torch, Orange Twist and Tutti Frutti and blended them from light to dark onto the paper. The background stamp must have had some ink left on it, so I ended up having some pink areas on the background. Also, the embossing powder didn’t set perfectly crisp. I like it when things don’t turn out perfect as it gives them a grungy look and because I love mixed media type cards, I actually loved the result. 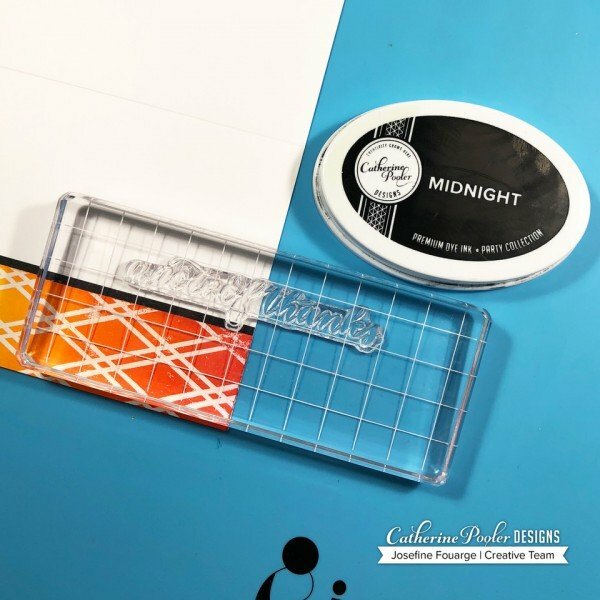 Catherine's inks blend beautifully, so I didn’t need to go back and forth several times to make the colors blend together. Once was more than enough. After I was done, I cut the piece of card stock in three identical sized pieces. For the first card, I adhered the strip on the left side of the long edge and stamped the “THX” from the “Note of Thanks” stamp set to the bottom right. I also added a few of the leaves and stars from the same set around it. A black strip of paper added a little contrast to the second card. I adhered the second piece to the bottom and stamped “a note of thanks”. Then I wrapped some black bakers twine around it. 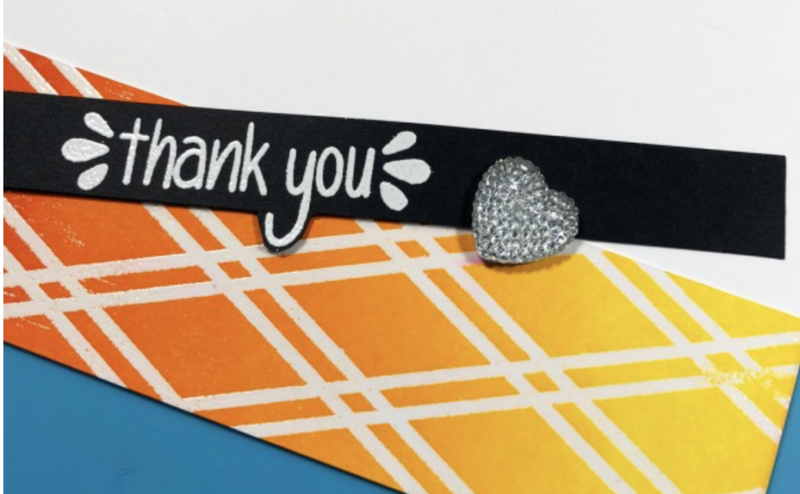 Card number 3 needed a little sparkle, so I decided to heat emboss the “thank you” in white, adhered it with the colored strip of paper to the bottom of the card and added a little, shiny heart next to it. These are just a few ideas on how you could decorate a set of thank you cards. Of course, there are a lot more options, including the use of different colors or adding more texture to the background. I hope you enjoyed my inspiration and can use the ideas for your own creations.